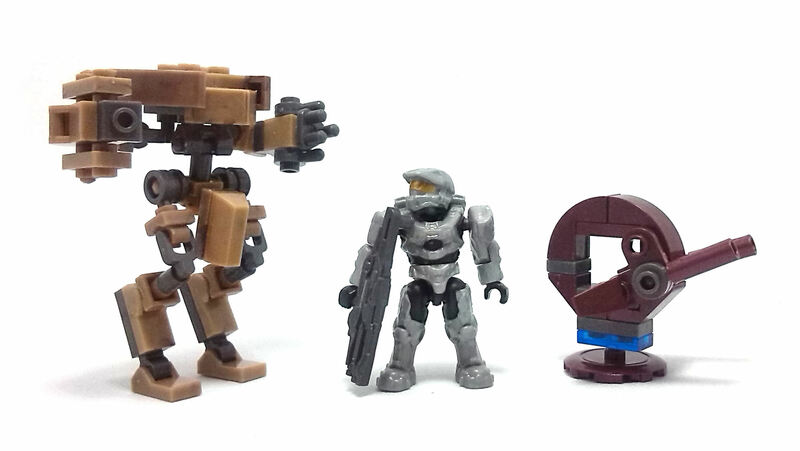 In 2014 we got to see a “new” scale in the Megabloks Halo range. The Halo Micro-fleet sets are very similar in concept to LEGO’s mini-creations, being built using only the smaller construction elements available in the parts inventory. 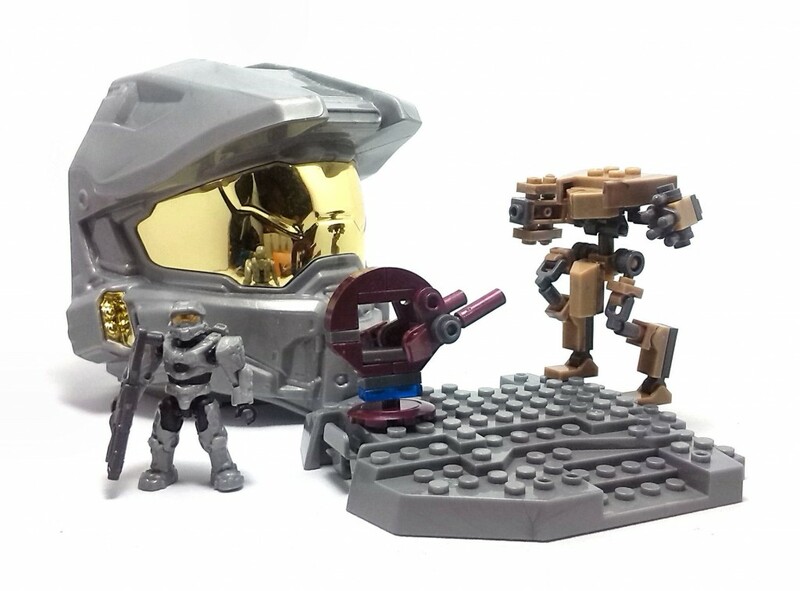 However, in true Megabloks fashion, they decided to sell their Micro-fleet sets with a larger container shaped like a Spartan helmet which reminds me a lot of the older Pyrates sets that used to come within a skull-shaped hull. The set I picked up was 97270 Micro-fleet Mantis Invasion listed as a 80 piece set, although as usual, there are a few spare parts thrown in the box. So, first things first. The Spartan helmet included is no such thing. It is more like a hollowed mask than a true helmet, since the back portion of it comes off to serve as a convoluted construction plate to place the micro creations. The shiny gold visor on the helmet looks nice and still makes for a neat display piece, as long as you don’t turn it around. 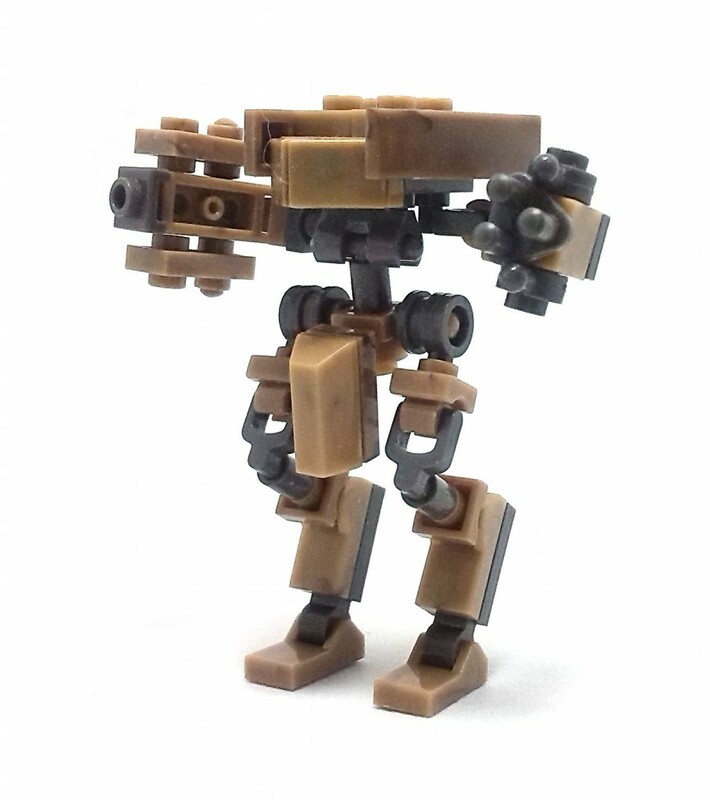 The set comes with the pieces to build a Mantis attack mech, and the finished piece looks nicely similar to the larger-scale Mantis released last year. However, the Micro-Mantis is not much of a toy because even though the model has extensive articulation, not all of the pieces involved were originally designed to function as joints, so often times pieces will fall off when trying to tweak a pose. 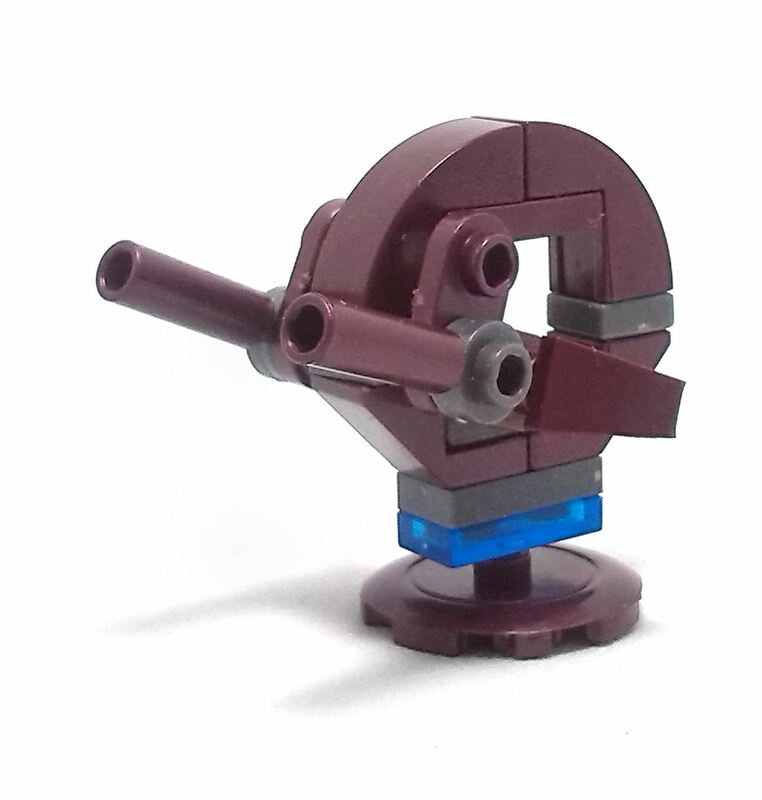 Also included in this set is one of the small gun turrets used by the enemy Covenant, referred to as a Shade Turret. 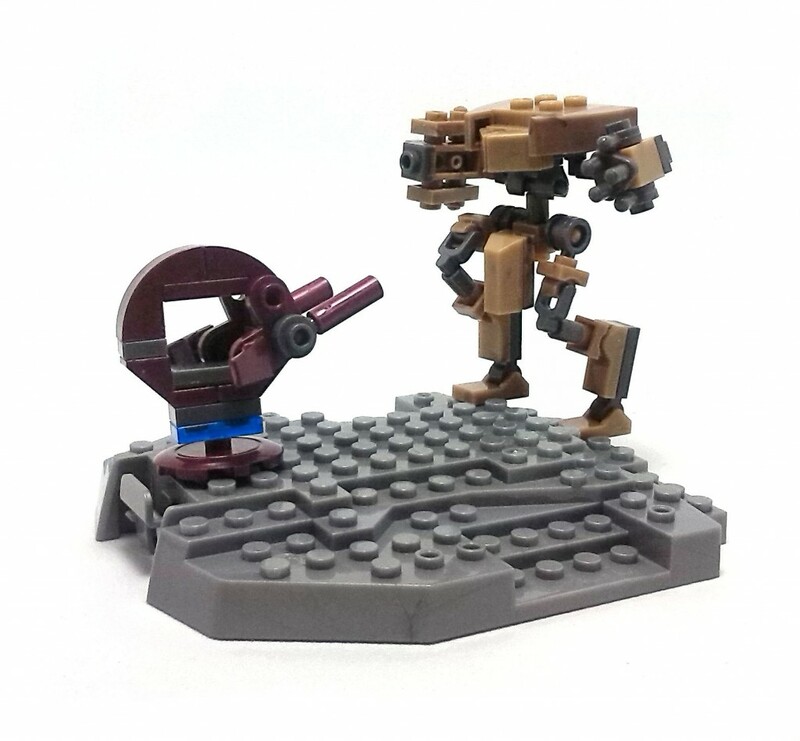 This piece is made from the smaller construction elements found in the Megabloks catalog and also sports limited articulation on the lateral weapon pods. In an effort to boost the play value of this set, Megabloks also included a regular scale Spartan minifigure attired in the latest version of the Mjölnir armor. This figure is made from silver gray plastic with a painted gold visor, matching the color scheme of the larger helmet/container. 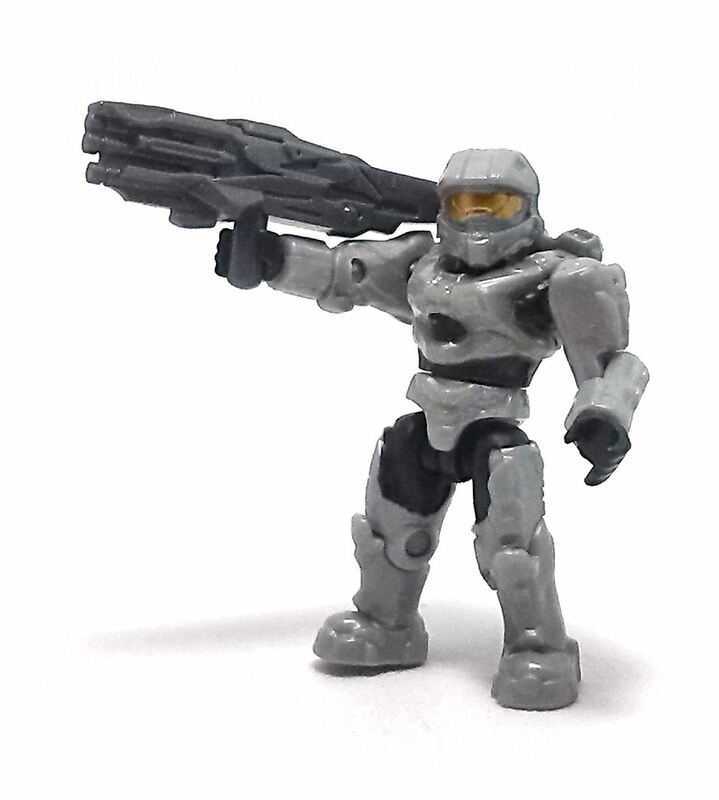 This Spartan comes armed with a weapon I had not seen before, called an Incinerator cannon. I did enjoy building these Micro-fleet pieces, but truth be told, the whole set feels more like a novelty than a real construction set and even though the included Spartan IV minifigure does a good job appeasing the disappointment of not getting a full Mjölnir helmet, I’d be hard pressed to recommend these sets for anyone other than die-hard Halo fans.